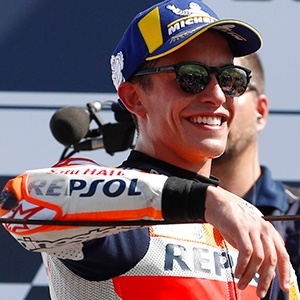 Termas de Río Hondo - World champion Marc Marquez stormed to his 53rd career pole position at the Argentina MotoGP on Saturday to stand just two off the all-time record of 55 held by bitter rival Valentino Rossi. Honda rider Marquez will start Sunday's race at Termas de Rio Hondo from the front row ahead of Spanish compatriot Maverick Vinales on a Yamaha and Andrea Dovizioso, the Ducati rider who won the season opener in Qatar. Marquez's 53 elite-class poles have come from just 110 races while Rossi's 55 have been achieved from 325 outings. He has now also taken the front-row spot five times in six races at the Argentina track. However, he has unsettled business at Termas de Rio Hondo after last year being sanctioned for a collision with Rossi which sent the Italian crashing out of the race. Dovizioso said he was relieved to have claimed the third-fastest time having tumbled off his bike without injury in free practice earlier in the day. "I am happy to start on the front row," he said. Rossi, on the second factory Yamaha and who accused Marquez of "destroying" the sport after their 2018 clash, was fourth in Saturday qualifying ahead of Australia's Jack Miller on a Ducati, last year's pole sitter, and Franco Morbidelli on a Yamaha. Britain's Cal Crutchlow, who won last year's rain-hit race, was eighth on Saturday on a Honda just behind France's Fabio Quartararo on a Yamaha-SRT. In the Moto2 race, Spain's Xavi Vierge qualified in the best time ahead of Germany's Marcel Schrotter and Thomas Luthi of Switzerland. Jaume Masia of Spain took pole in Moto3.